Visit any U.S. Lane Bryant store location or Lane Bryant online and enjoy a special offer where you can save up to $75 off your purchase. Take $25 off your purchase of $75 or more. Take $50 off your purchase of $150 or more. Or, take $75 off your purchase of $225 or more. 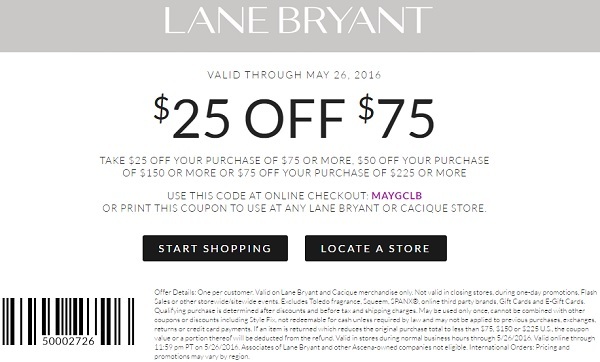 Print the coupon and show it at your nearest Lane Bryant store location to receive the offer. If you want to shop online use promo code MAYGCLB at checkout. Source of the information is Lane Bryant. Offer is valid until May 26, 2016. For more information about this amazing offer visit your nearest store location or official website.